Just when you think you’ll never hear any more from this highly enjoyable grindcore wrecking crew, (their last release came out in 2013), we get a brand new album containing 19 tracks; 23 minutes of material to enjoy. This album is bigger and bolder than their previous two as well. Okay, so duration-wise there’s not too much in it really, but in confidence and delivery levels, Extinction Solution sees the band arguably at their best yet. The songs are well-written and show an understanding of how to craft raw, abrasive grindcore that still has elements of catchiness and compositional know-how stapled to the side of the break-neck delivery. This is savage, ferocious stuff. The band are sharply brutal as they cut their way through the short tracks, all blasting mayhem and ripping grooves. 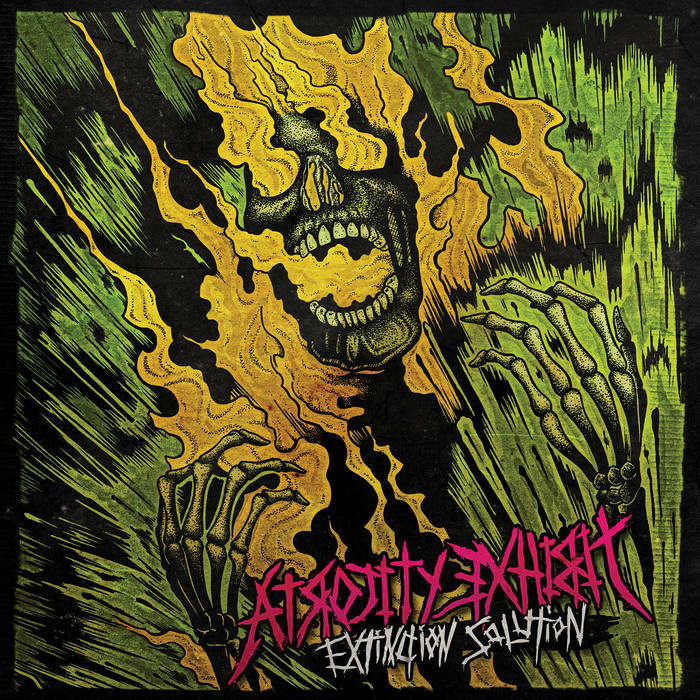 Elements of sludge and crust can be heard, but ultimately the whirlwind of destruction that is Extinction Solution just wrecks everything around it in its quest for grinding extremity. Vocally we get screams, growls, roars, shouts, bellows…all kinds of stuff. It all adds to the caustic music in ways that please. This is probably my favourite release so far from this energetically nasty band. It’s great to have them back. This entry was posted in Grind and tagged Crust, grind, Grindcore, Metal, Sludge, The Atrocity Exhibit. Bookmark the permalink.